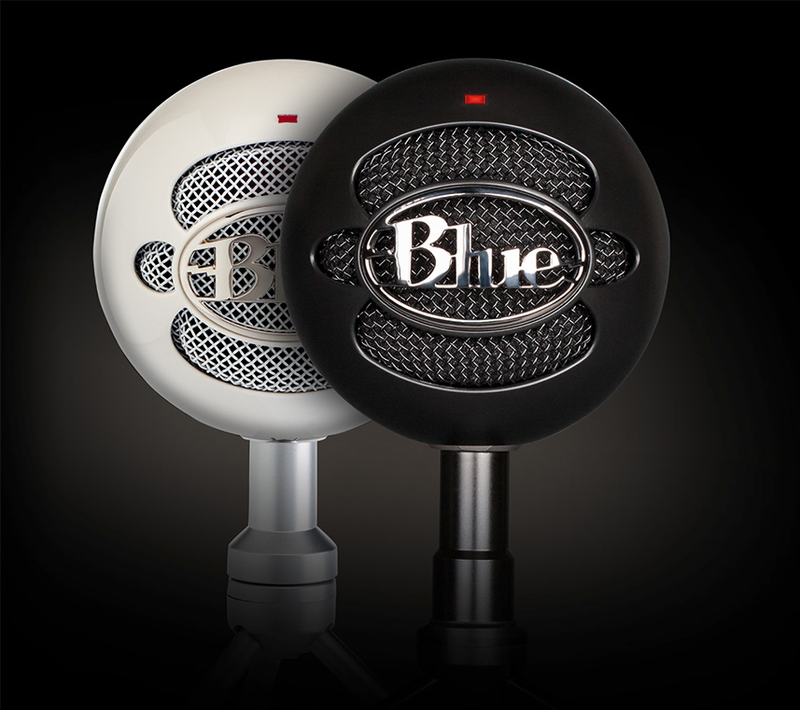 I know I’m not the first person to ever review the Blue Snowball iCE microphone (Snowball), but I am a professional reviewer, podcaster, and videocaster, so I’m evaluating it from the point-of-view of someone who might shop for this microphone to create professional voice recordings. I purchased this unit from Amazon, myself, so it is not a review unit supplied by Blue Microphones or a PR company. I bought it for use as a home recording unit, because I use my Blue Yeti microphone for creating professional SecurityNOW podcasts with Preston Smith. 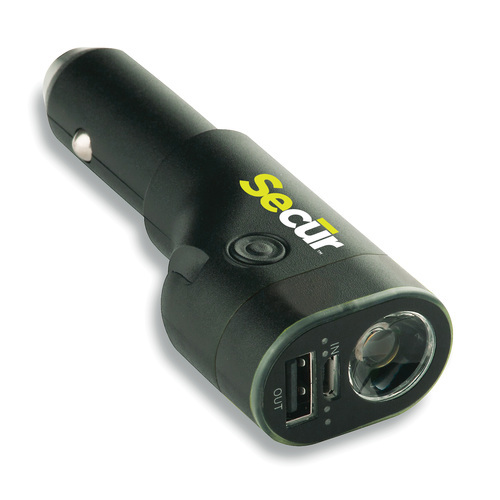 Originally, I purchased this one to be the SecurityNOW microphone and to leave my precious Yeti at home. However, the Snowball lacks certain features that I require for my professional podcasts. So, I’m reviewing it here to give you the highs and lows of it in case you’re considering it for your own work. The Snowball is small, light and well-built. The price is right at $44.99 and free shipping from Amazon. The Snowball dismantles into the ball, the small stand, and the USB cable for a fairly compact transport. The sound is very good for the price. The microphone and parts feel durable and should last until its $45 value has been fully extracted. I like the cardioid voice pickup pattern. It filters out a lot of the ambient background noise from behind the microphone and in other parts of a large room, focusing on your voice. The Snowball has no features. It’s a microphone on a stand and that’s it. It has no volume knob or any other adjustment buttons, sliders, or switches. It’s on when you plug it in and off when you unplug it. There’s no mute feature on the microphone. The non-adjustable stand is small and three to four inches lower than optimal height. 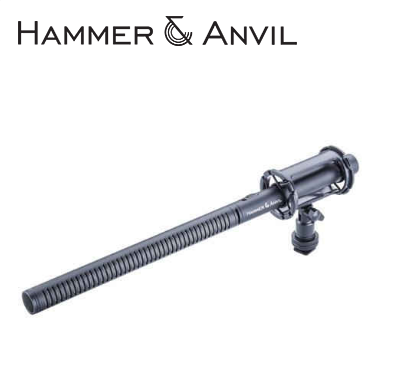 The stand attaches to the microphone with a non-standard screw size, so you can’t mount it to a tripod of any kind, though you can optionally purchase an adjustable microphone ‘arm’ for $18. The only accessory that I know of for the Snowball is the Ringer, which is a shock mount for $43.00 on Amazon. The shock mount gives you more options for placement, like the adjustable arm, plus it dampens sounds from bumps and other movements. Frankly, the Snowball should be used with a Pop Filter to filter out the “pops” you hear when speaking close to the microphone, which you really have to do with the Snowball to capture good sound quality. The optimal distance from the microphone is probably three to four inches, depending on your voice quality and volume. Here is a sample of raw audio from the Blue Snowball iCE. However, if you spend $45.00 for the Snowball, $43.00 for the shock mount, and $10.00 for the pop filter, you’d be better off buying the Blue Yeti USB microphone for $100.00. It’s a much superior microphone and you’ll like it a lot better. Overall, the Snowball is a decent microphone. I can’t say that I’d purchase another one, but for $45.00, it’s OK. I think my money would have been better spent on a different microphone that has options, better sound, and a more convenient or adjustable stand. If you’re wanting a microphone for some light podcasting, Skype, or test recording of some type, this microphone is certainly good enough. If you have any aspirations of doing anything long-term, professional, or something with an adjustable stand or even a volume knob, don’t buy this one. Recommendation: Don’t buy it unless you really like having no options and a mediocre microphone. Opt instead for the Blue Yeti. 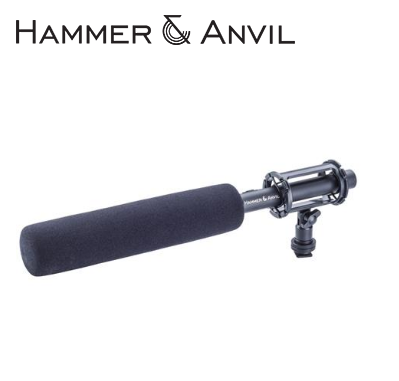 The Hammer & Anvil MK-ENG600 Professional Supercardioid Shotgun Microphone (ENG600) is a professional XLR microphone for serious videographers. Most amateur videographers won’t have the equipment required for connecting XLR microphones to their video equipment. The ENG600 can be mounted on-camera in the hot shoe, onto a boom pole, onto a tripod, onto a cold shoe, or hand held. 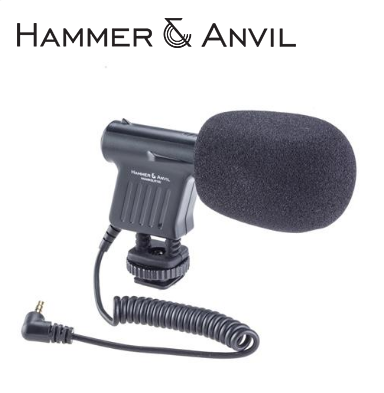 At $139.95, the HAAMKENG600 is a bargain when compared to other microphones of this quality. By comparison, microphones of this quality range in price from $199.95 at the low end and top out around the $600 mark. 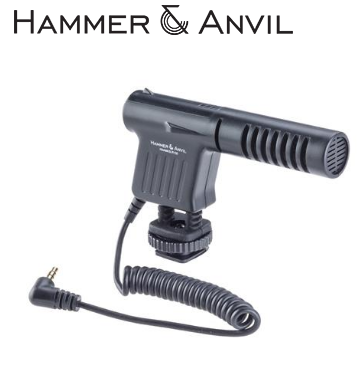 Why it’s Frugal: The Hammer & Anvil Professional Supercardioid Shotgun Microphone (HAAMK-ENG600) is frugal because it is a high quality, professional microphone that is half the cost of its competitors, plus it includes the XLR to 3.5mm connector (A $10+ value), and the “dead kitten” wind muff (A $25+ value). It also features phantom power and power from a simple AA battery. Frugal. The ENG600’s proof is in the demo that I recorded using my iPad as a video device in the video. The audio is excellent even with the ceiling fan and two computers on just next to me. The audio is clear and I’m not peaking as I usually do with microphones of lower quality. Professional audio also doesn’t have too much bass in it or amplify any particular range, but rather replicates accurately. The ENG600 is an all-around great microphone and this won’t be the last you’ll hear of it in my videos. I’m pretty sure that this microphone is going to be my professional “go to” microphone for stationary, as well as, walking around video using my iPad and my video camera. The XLR interface makes it an excellent choice whether you’re using it directly from XLR to the camera, to an audio recorder, or through the 3.5mm converter. This microphone is great for interviews, documentaries, and YouTube audio capture. The size of the ENG600 (15 inches) is impressive as well as its ability to pick up sound directionally in front of it. It has a standard cardioid pickup pattern, but on supercardioid mode, its reach extends to grab input from several feet away, while still filtering out unwanted side and back noise. Although the ENG600’s size seems daunting, you’ll appreciate it once you hear the audio. It’s true that you might “stick out like a sore thumb” where you’re recording, but the results and the price speak for themselves. I’ve never seen a bad review of this microphone and you’re not likely to find one. The ENG600 is a lot of bang for the buck. 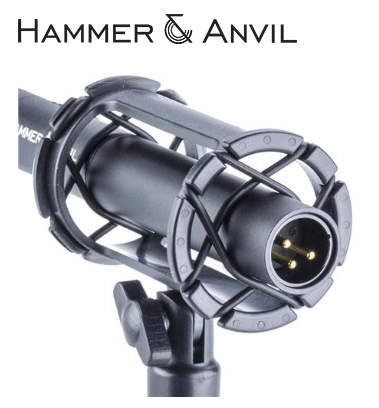 I highly recommend it and I really love the quality of construction, its ease of use, the incredible shock mount (spare bands included in the package), the wind muff, and the XLR to 3.5mm converter cable. The only thing missing is the three pole to four pole converter so that the microphone can be used with iPhones and iPads. I know that’s not a requirement, but it would be a ‘nice to have.’ It’s an absolute winner. Recommendation: If you’re serious about audio, buy it. Buy two and realize that you’re still under budget. If you’ve searched high low for a monopod that you can use in just about any situation, stop looking, this is it. The 3PVM4A Monopod by 3Pod, sold by Adorama is one fine piece of photographic machinery. And for under, a lot under, $100, it’s the best I’ve seen. At a whopping 65.5 inches high (max), it’s comfortable for taller photographers to use, without having to crouch or bend down. I should know; I’m one of those taller photographers. This one also quickly adjusts from two feet high (23.5 inches, to be exact) to any height in between. The fluid base allows you to make smooth panning movements when the feet are down. 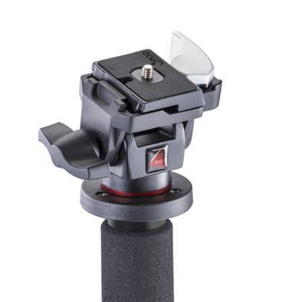 Without the feet in the down and locked position, you have a standard monopod featuring three fast open/close flip locks for quick and easy height adjustments. Joseph Butler and I review the 3Pod Monopod with Tilt Head. The best feature of all. Wait for it. Look at the picture and see if you can figure it out. That’s right! It can stand on its own. 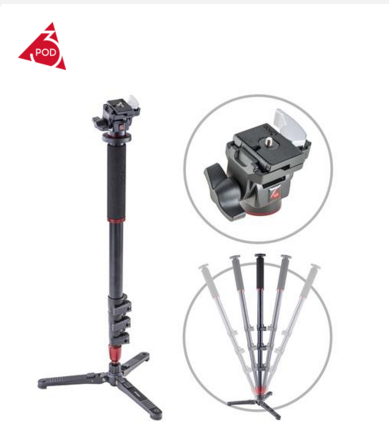 At the very bottom of the monopod, you can fold down three locking legs to steady the monopod while you walk away to get yourself on camera, have an interview, or just to check focus. Sure, you can use it like a standard monopod, but those three little legs make this the bringer of the best of both worlds. Frankly, since receiving this, I haven’t used a traditional tripod again. Which in part is some of my excuse for the delay in posting this review. I suggest purchasing the bundle. You save $12.00 by buying the Tilt Head with Quick Release, so why not make a frugal choice? For $79.95, you get the Monopod, the 3PSHT1, bag, and adjusting wrench. 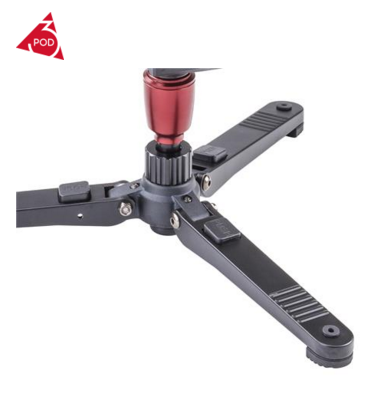 Even if you decide to buy another monopod head, this one will serve you well. If you’re worried about camera weight on the monopod, let me put your fears to rest. It has held a Canon 60D with 18-135 zoom lens and a shotgun microphone without any issues. What I really love about this setup is that it’s built for the run-n-gun photo/videographer who also might need to jump in front of the camera to narrate or to introduce a guest. You can walk away with confidence that you’re not going to end up with a smashed camera in the process. For photographers and videographers on the move, the monopod has a large padded handle that’s easy on your hands, plus it’s non-slip feature keeps your equipment safe while you’re running for the shot. The three quick-release height adjustments allow you to keep moving while you adjust the height of the monopod too. And if you don’t want to run with the monopod feet in the down position, they have “step-on” releases so that you can pick up and run without hesitation. The Tilt Head with Quick Release is a ‘must have’ item because you can remove your camera from the monopod without disturbing the monopod’s position with just a snap of the silver lever you see at the right of the quick release mount. You can also come back and place your camera on the monopod without twisting, turning, or fussing with a ‘pod screw mount. Just place your camera back onto the monopod and turn the lever to secure the quick release mount and start your scene. It is literally a one-two movement and you’re back in business. Plus the Tilt Head stays gravity-centered for vertical shots. I love the 3Pod monopod. It is the perfect ‘pod for me. It’s not bulky and cumbersome like a tripod, nor is it awkward and always in hand like a traditional monopod. It’s also not a pain to setup and adjust like most tripods are. To me, it’s the best of both worlds. It is the monopod that I wish I’d invented, but for $80, who needs the headache of prototyping, crowdfunding, begging for supporters, and wasting a bunch of energy when 3Pod has created the perfect ‘pod. Why it’s Frugal: If it isn’t already obvious, the 3Pod monopod-tilt head with quick release is extremely frugal. First, you can buy the pair and save $12.00 (frugal). Second, you don’t have to carry a tripod and a monopod everywhere you go and fumble around with them–you have a monopod that can stand alone (frugal). And third, you don’t have to have another person with you to handle the camera while you go stand in front for an introduction, an interview, or a focus (frugal). It’s the best $80 you’ll ever spend on photography equipment. As you can see in the video, Joseph and I both love the monopod. We fight over it and it’s hard to pry it from our grubby hands once one of us has it in possession. Seriously, it’s that good. For serious photographers and videographers at any level, this monopod beats any that I’ve ever used or seen. And yes, I’ve used the one that you’ve heard of (Sounds like a character from Lord of the Rings) and this one beats it many times over. The build quality is excellent. The quick release latches are easy to use and quick to adjust. No slips, no tips, and no lost cameras. Recommendation: Buy the bundle, save a small bundle, and enjoy your new favorite and essential accessory. 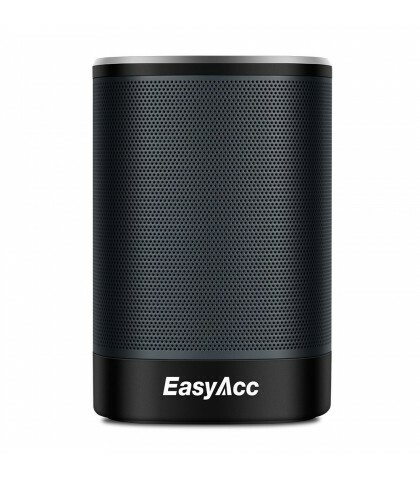 The EasyAcc DP100 Bluetooth 4.0 Portable Speaker (DP100) is a small (2.6 x 2.6 x 3.8 inches), coffee cup-sized speaker that is one cool sound machine. The DP100 sports a full 4 Watt 45mm driver that can turn any room into a fully immersed music experience. But please don’t damage your hearing or disturb your neighbors with this speaker. Now this speaker won’t vibrate the car next to you at a traffic light, but it does put out some great volume. 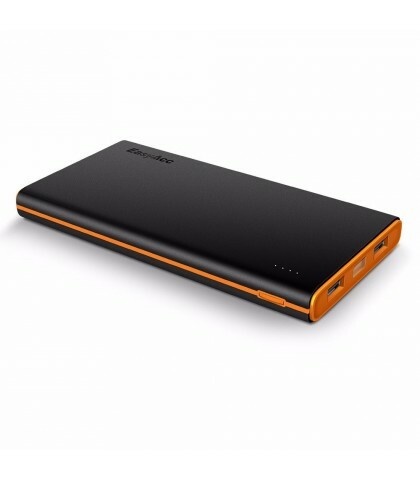 And its small size means that it’s ultraportable and easy to carry with you on camping trips, day trips, picnics, and on the days when you can have lunch outside at work. The DP100 pairs in seconds as you can see on the video, so no matter where you are or who you’re with, someone can connect to the speaker for shared play. You can control volume and all music controls via the soft press buttons on top of the unit. You can also control the speaker from your phone. At home or in an office, the Bluetooth 4.0 connectivity limitation might be the standard 10m/30ft, but outside where there are no walls or metal frames, you can be separated by 30m/100ft. The cool thing is that you can still hear the speaker at that distance. 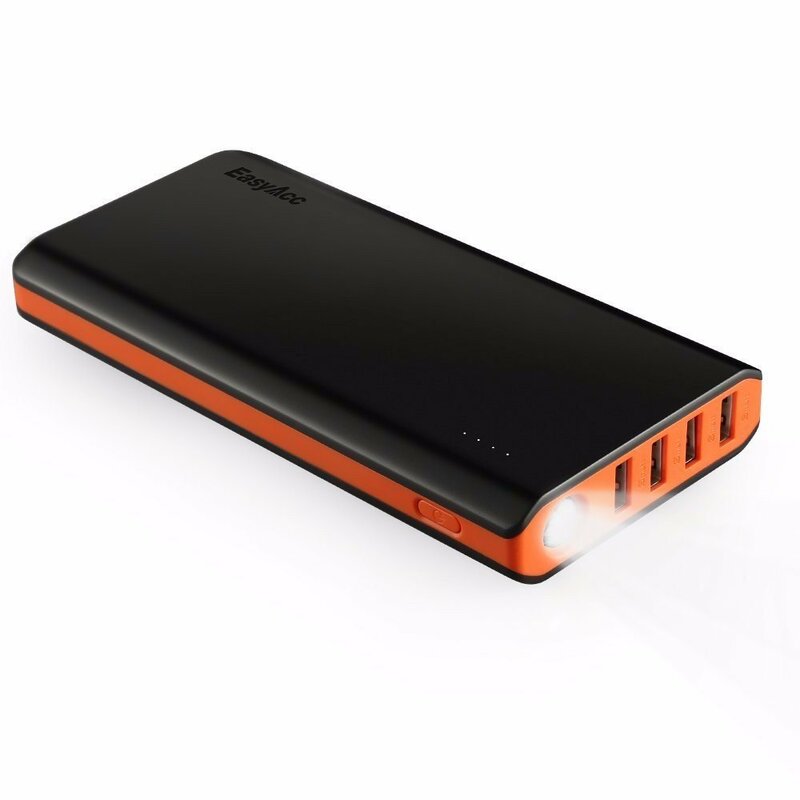 EasyAcc makes some great products and the DP100 is no exception. Look for other EasyAcc product reviews here on The Frugal Networker site. Every product from EasyAcc is well made, performs very well, and is priced perfectly. Why it’s Frugal: The DP100 is frugal because it is a lot of product for a little money. Its solid construction, long battery life, and big sound means that you can keep this little gem for years of enjoyment and that’s frugal. Check out the video for a good review of what’s in the box, a demonstration of the speedy Bluetooth connectivity, and a good sound sample. I really like the DP100, but did find that I have trouble with the controls. It’s possible that I just haven’t taken the time to learn the controls, but I haven’t really needed to use them either, so it’s a tradeoff. Read the included documentation to find out how to use the device and you’ll be happy. The DP100 is a great little speaker at a great price and it makes a great gift and a nice stocking stuffer. Recommendation: Buy it. It’s good frugal fun.